The weather is getting cold, and Thanksgiving is almost here. We are pulling out the old holiday items, and starting to think about how to decorate the house. The great thing about your Holiday home is that you can add a few new pieces to make it something special and change it up a bit this year. Emerald City SparkleThis year, Emerald Green was named the Color of the Year. What better time to jump into the trend than during Christmas. We put together a theme of traditional colors with a Wizardly twist. 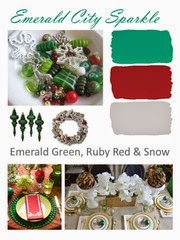 Use Emerald Green, Ruby Red and Snow. Yes, there was snow in the Wizard of Oz. Remember how Galinda woke up Dorothy from sleeping in the field of poppies? It is easy to get these colors into your home because they are so readily available. Just add a twist like snow white pine cones or a dash or sparking ruby red on ornaments or in small accents on the table. If you like the rustic or industrial look in your home, this is the Holiday Home for you. These are colors that integrate nicely with woods. Even better, the texture of sparkle and feathers helps to soften the strong metals of industrial. 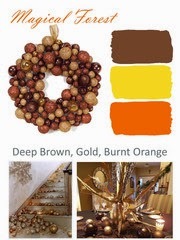 This looks takes the traditional color of gold used throughout the holiday and blends orange and brown earth tones. You can get inventive with birds and feathers in this look. There are a lot of elements available for you. Adorn your table with a golden runner with brown accents or ribbons. It will make every meal a sparkling feast and get you through the beginning of winter. This looks is great because you can have it transform your home during the holiday and keep elements of throughout the winter. We loved this theme so much, we decided to keep it for this season. 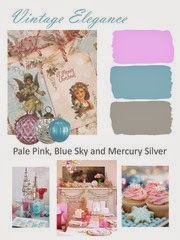 The lovely pink and blue hues provide a great alternative to traditional holiday decor. You can create a shimmery winter wondering with pale pinks and icy blues to create a warm and feminine twist on holiday decorating. Using mercury glass and distressed silver is a great way to add some age and personality to the items in your home. Placing vintage inspired tins, distressed candle sticks or other new items with that time worn feel add some dimension to your holiday home. Finding vintage holiday cards and ornaments create that time-loved feel. However, there are many new products created with a vintage look, that you can easily integrate new finds with treasures from years past.